In an attempt to smear Mike Austin's good name, Tom Shively and his campaign are spreading lies about his record. Shively's latest radio ads claim he is an "all star" candidate and that Mike Austin has "struck out" with a "D Rating" from the NRA. The gun rights group's website lists Austin's rating as an "A." Shively fails to mention he has never sponsored a bill of his own and he supports a $1 billion tax increase. "It is once again clear Tom Shively will do or say anything to get elected," said Austin. The Republican's campaign sent a letter to radio stations yesterday asking them to remove the ads in an attempt to maintain their integrity in providing accurate information to area voters. Shively's add also erroneously reports Mike Austin receives donations from "big city lobbyists," when it is Shively who is almost fully-funded by union bosses and trial lawyers. "I will not ruin my name or the integrity of my supporters by engaging in these types of lies," said Austin. 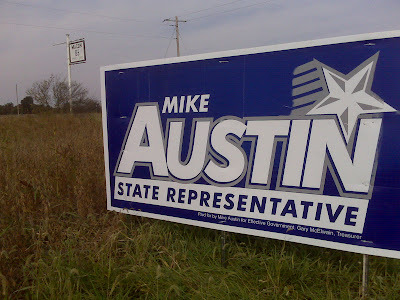 Today, Mike Austin continues to visit with voters while Shively is deciding whether or not to pull the remainder of his ads from stations who have not done so on their own. "I'm asking my supporters to pray for strength and wisdom these last couple of weeks," said Austin. If you drive between Macon and Atlanta, you are going to see a lot of Austin signs. But... one new one might turn heads. Macon Co. Assessor Jim Palmer, a retiring Democrat, has an Austin sign up at his Highway 63 property - the gun club. The location has been traditionally reserved for Dems only since Palmer became an elected official. However, some say the addition of an Obama sign placed by local volunteers pushed Palmer over the edge. Interestingly, Palmer also asked for a Tony Askew (R-Atlanta) for Assessor Sign. Sources say he and Democrat primary candidate Vanita Christy, who works alongside Palmer in the courthouse, are publicly supporting Askew's campaign as the "qualified" candidate.